If you are looking for a Melbourne jeweller to hand-craft a genuinely unique engagement ring that is just as special as the person who will be wearing it, GN Designer Jewellers is at the top of their field for beautiful handmade engagement rings. For elegant, custom engagement rings, one of a kind white gold wedding rings, and a multitude of timeless pieces, the team at GN Designer Jewellers in Melbourne will be happy to help you find whatever your heart desires. You can look through our vast range of designer engagement rings in the showroom or opt for a custom engagement ring designed by you. Our expert crafters will take you through every step of the way, from initial designs to the perfect handmade engagement ring that will perfectly symbolise your love. At GN Designer Jewellers, we are masters of creating custom pieces to express your love, from unique engagement rings to white gold wedding rings. We make all our jewellery right here in Melbourne using precious stones and metals, ethically sourced, from all over the world. Our team of crafters create custom engagement rings that you and your loved one will cherish. Specialists in jewellery making and design, GN Designer Jewellers, can fulfil all your needs when it comes to engagement and wedding rings in the Melbourne CBD. Our team will answer any questions, share our knowledge and guide you in your choice of designer engagement rings. We will get to know you, listen to your story and help you come up with the perfect symbol of your love. Experts in their field, our Melbourne team can help you choose the right unique engagement ring for you. We can present you with a stunning display of diamonds and gemstones to find what you are looking for. Using only diamonds certified by the Hoge Raad voor Diamant, also known as the Diamond High Council, or more commonly the HRD, the Gemological Institute of America (GIA), and Auscert. Our onsite designers will work to your design ideas and create a spectacular custom engagement ring that showcases our expert craftsmanship and your sentimentality. Offering you a ring that tells a story, that brilliantly shines, a ring that no one will say no to! When crafting custom engagement rings, you can trust GN Designer Jewellers in Melbourne to ensure a perfect ring for your perfect match. Our jewellers will guide you in the design process, and we have plenty of inspiration in our Melbourne store and online. We have designer engagement rings inspired by the decades of Art Deco, Art Nouveau and 1950’s minimalism, all of which hold our modern and unique twist. When crafting custom engagement rings, we will utilise our thorough knowledge of jewellery through the ages and implement your ideas and inspiration into the final product. GN Designer Jewellers in Melbourne also offers the option of remodelling engagement rings. If you have antique jewellery or an engagement ring that has been handed down, we can take the stone and remodel it into an elegant new piece, forging the past with the future. If you wish to keep the original design, we can repair and bring back to life a precious heirloom. An engagement brings the promise of a new family, and heirloom can be a perfect symbolic choice. If you don’t possess one, any personal symbolism or designs can be incorporated into the custom engagement ring to showcase your history, or it can be a chance to start a new tradition for this new chapter. For a unique engagement ring and exquisite service, visit our Melbourne store, where you can browse our array of designer engagement rings and jewellery, meet the team, and take the next step with GN Designer Jewellers in Melbourne. 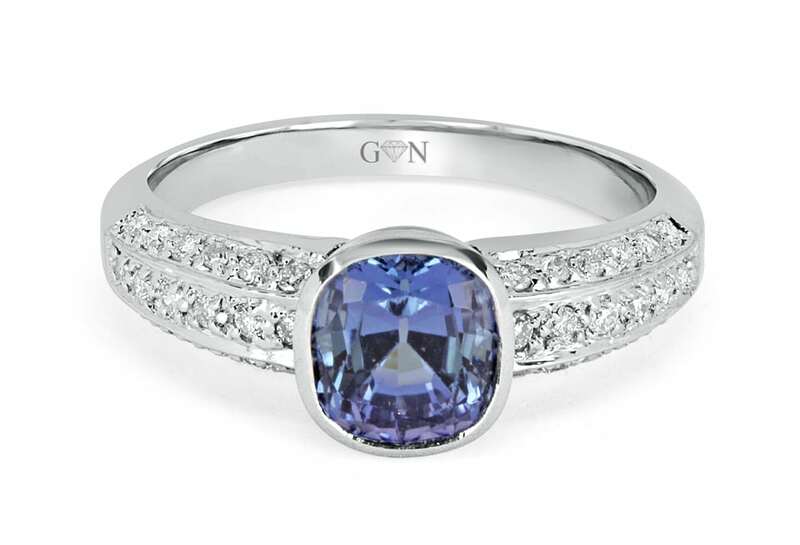 An engagement ring from GN Designer Jewellers is a remarkable promise. The commitment you want to make comes with our guarantee that we will deliver a beautiful handcrafted, ethically sourced engagement ring that will last a lifetime. The ring is an eternal symbol of enduring love, and with options from solitaire designs, trilogy, halo, vintage-inspired, diamonds, gemstones and a variety of precious metals to choose from, you can be sure to find something unique. Our engagement rings are all designed with the purpose of being offered with love and worn with pride. The rings perfectly circular design means they can conveniently be worn on display, but the geometry is also very symbolic. With no beginning and no end, they perfectly symbolise eternity, wholeness and perfection. They also carry the symbolism of the sun, moon and planets, the bringing together of all life, that promise that engagement can bring together two lives. Three stone engagement rings are an excellent representation of a couples personal symbolism, embodying the past, present and future. Three stone rings can be made in all different shapes, though round, princess, and emerald cuts are the most common. Another way to add a personal symbol of the person giving or receiving the ring is incorporating birthstones like sapphire, diamond or topaz, and these are all excellent engagement ring choices. For more information about our custom and unique engagement rings, contact GN Designer Jewellers, or visit our Melbourne store.